Any information collected can be first arranged in a frequency distribution table, and this information can be put as a Visual representation in the form of pictographs or bar graphs. A Bar graph is a representation of numbers using bars of uniform width and the lengths of the bars depend upon the frequency and the scale you have chosen. Graphs are a visual representation of organised data. You can look at the bar graphs and make deductions about the data. You can also get information based on these bar graphs. The bars can be plotted vertically or horizontally. 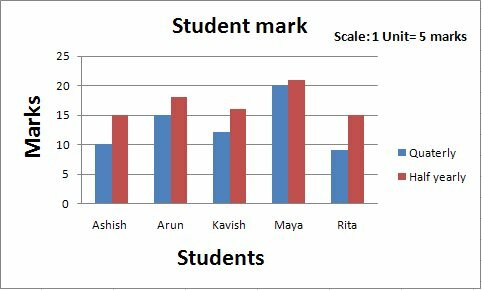 Bar graphs are used for plotting Discrete or discontinuous data, i.e. data that has discrete values and is not continuous. 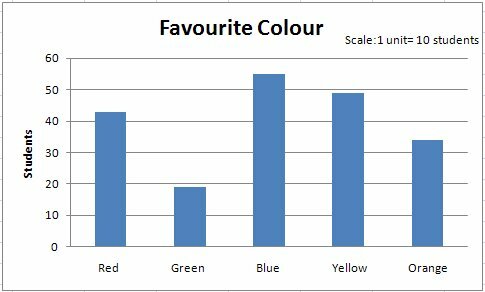 Some examples of discontinuous data are 'shoe size' and 'favourite colour', for which you can use a bar chart. On the other hand, examples of continuous data include 'height' and 'weight’,’ Marks’. A bar graph is very useful if you are trying to record certain information, whether the data is continuous or not. Two hundred students of 6th and 7th class were asked to name their favourite colour so as to decide upon what should be the colour of their School Building. The results are shown in the following table. Blue is the most preferred colour (Because the bar representing Blue is the tallest). Green is the least preferred colour. (Because the bar representing Green is the shortest). There are five colours. They are Red, Green, Blue, Yellow and Orange. (These are observed on the horizontal line). Double bar graphs are used for comparing data between two different things. The difference between a bar graph and a double bar graph is that a bar graph displays one set of data, and a double bar graph compares two different sets of information or data. Since there seems to be a marked improvement in most of the students, the teacher decides that she should continue to use the new technique of teaching. We have learnt that a bar graph is a representation of numbers using bars of uniform widths. We have seen Bar graphs are used for plotting discrete or discontinuous data. The bars can be plotted vertically or horizontally. Double bar graphs help to compare two collections of data at a glance.